Raj serves on the Boards of Directors for two Fenway Summer-seeded startups: a mass-market credit card venture, FS Card, and a private student lender, College Avenue. He also serves as a Director for a number of other innovative, high-growth firms in consumer finance, including Prosper, the peer-to-peer lender; Circle, the digital currency firm; and Green Dot, a bank holding company. For Raj, Fenway Summer is the latest chapter in a long and varied career in and around U.S. financial institutions — as a senior policymaker, as a bank executive, and on Wall Street. Raj was the first-ever Deputy Director of the U.S. Consumer Financial Protection Bureau (CFPB). As the Bureau’s second-ranking official, he helped steward the CFPB’s strategy, its operations, and its policy agenda. He also served on the senior staff committee of the Financial Stability Oversight Council, and as a statutory deputy to the FDIC Board. Before being appointed Deputy Director, Raj acted as the interim leader of the new agency, serving as the Special Advisor to the Secretary of the Treasury. He led the CFPB for most of the first six months after its launch. Before his time in public policy, Raj was a Managing Director in the Financial Institutions Group at Deutsche Bank Securities, where he led the firm’s investment banking coverage for the largest U.S.-based banks and thrifts. His client work focused on calibrating credit deterioration, evaluating capital-raising alternatives, and generating liquidity. 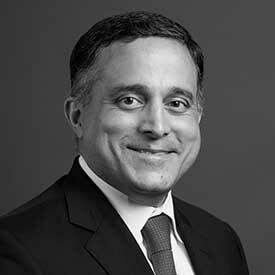 Before that, Raj was Senior Vice President for Corporate Strategy and Development at Capital One Financial, where he led M&A development efforts across the U.S. banking and specialty finance markets. He began his business career in the financial institutions practice of the consulting firm McKinsey & Company. He has also served as an attorney in both private practice and government service.